Apple is looking into integrating its Siri virtual assistant into the company's Messages platform, according to a patent published today, enabling the AI to provide directions, retrieve movie times, and assist with peer-to-peer payments, among other potential uses. 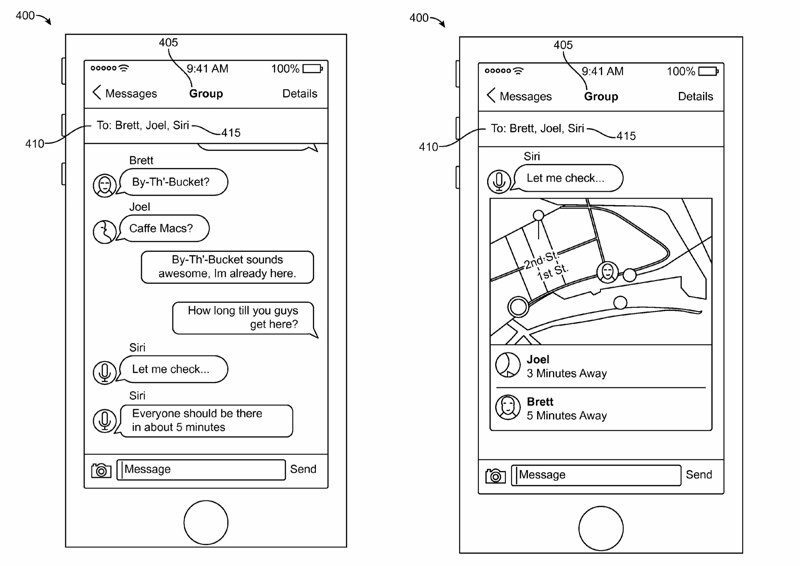 Picked up by AppleInsider, Apple's application for a "Virtual assistant in a communication session" appeared on the U.S. Patent and Trademark Office's website on Thursday, and details a system in which iMessage users can invoke Siri from within chat threads to get answers to relevant queries, complete scheduling tasks, and more. One scenario describes an instance in which users chatting amongst themselves bring Siri into the conversation simply by including it in the group thread. Using semantic analysis, the AI detects when it may be of help to complete a task and pitches in accordingly - such as finding a place to eat nearby, and telling the user how long it will take for their friends to arrive. Although Siri's responses don't appear to other users, the assistant is able to parse their messages in order to work out whether it can help with a task. For instance, in another example, the user asks "Siri, help us schedule a meeting," in a group chat thread and the AI cross-checks open calendar dates for the present users to suggest a potential meeting date and time. Participants can then vote for a preferred time and place, after which Siri schedules the meeting in everyone's calendar. In another example, chat members are notified that a user is utilizing Siri and are asked if they would like to do the same, and participants can approve or deny AI access to personal data about them during the chat session. Meanwhile other scenarios depict AI interactions during peer-to-peer payments, for example by determining which financial apps are being used by each chat member. Some of the implementations in the patent bear similarities to actions already offered by Google Assistant in Google's Allo app, and by chat bots in Facebook Messenger, while third-party apps like PayPal and Uber currently offer Siri functionality following Apple's release of the Siri SDK to developers. Whether or not Apple decides to integrate Siri in Messages in a future update, the AI is likely to require extensive development before users consider inviting Siri to conversations and extending access to their data. First Google glass, now Allo, I can only hope the next idea Apple rips off of Google involves free unlimited cloud photo back-ups. Come on MR members, don't think, don't discuss, ignore all nuance, just react!! Public hanging of Cook is the only thing that'd shut this knee-jerk crap up for a while. Until his replacement does a far worse job, that is. You do realise that your posts are as cliché as the ones you seem dedicated to mocking? Good news: it's not emoji related. Bad news: who cares this 'machine learning smart chats' ? I didn't know innovation was just copying. Apple doesn't seem to have an original thought of late. No thank you Apple! How about working on a new Mac Pro for a change? Agree. Apple's attempts to charge, for what I receive for free from Amazon and Google, keep me entirely in their ecosystems, and entirely out of Apple's. All I use Apple for is their hardware, for gateways into Google and Amazon. And Apple hardware is starting to fall behind. I wouldn't have believed it two years ago, but I'm starting to see a slight possibility of having a completely Apple free life in a few years. Apple, as I've pointed out in the past, jumped the shark with Beats. They need to go back to making the best hardware there is, charge a lot for it, then have unlimited free services (music, backup) as a side benefit. Otherwise I'll probably eventually be out of here. I've already started buying non-Apple gateways: Echo. Go ahead and leave the Apple ecosystem if you feel it no longer meets your needs, by all means. No need to sound like you have just woken up from the Matrix. Can someone tell me how Apple can get a patent for this when Google already has this concept in Google Allo? Did Google not file a patent for this already?